For me it was the first time travelling by myself to a faraway country. Linda from CTA and the Moholoholo staff have really helped me to feel at home in South Africa! I have done and seen so much at Moholoholo. At the centre, I had the opportunity to raise a Scrub Hare. 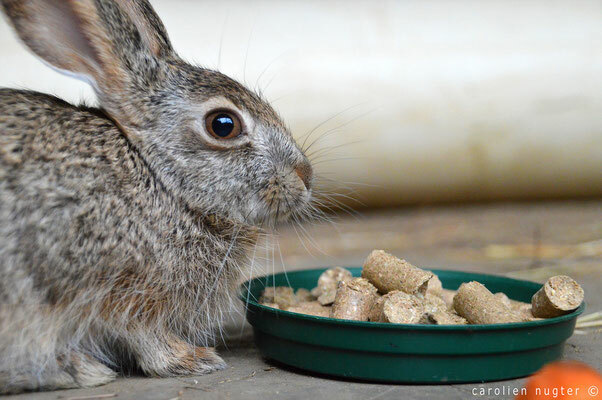 This hare was brought in, because some people were trying to sell it as a pet on the side of the road. The first weeks of rehabilitation are always the hardest, but the hare got through well; he is beautiful, big and healthy and he is released in the reserve! 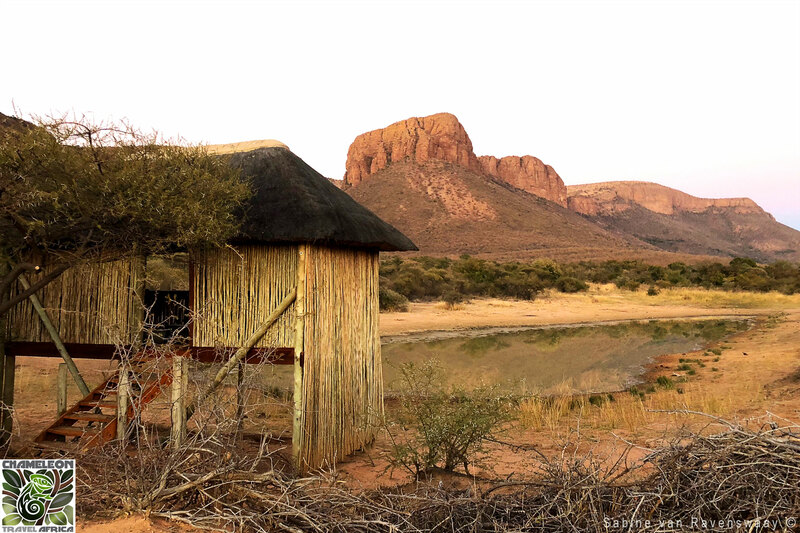 Moholoholo lies at the foot of Drakensberg and the view is magnificent. Every day the mountains look different! It was an amazing 6 weeks and the project is definitely worth another visit! At first all I knew was that I wanted to volunteer, but where, what? 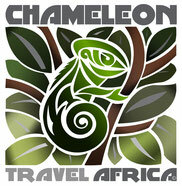 Via a message on Facebook somebody introduced me to Linda and CTA (Chameleon Travel Africa). We discussed different projects and felt the Wildlife Monitoring Project would suit me. Linda was very helpful and answered all my questions. The project itself was great, it was an amazing experience. They pick you up from the airport and take you to the project (while doing some shopping on the way). The first morning you get an introduction, watch a movie about conservation and get all the information you need for your stay. Every day at 6am we would go to the park and come back around 12am, then lunch and a break in a hammock in the sun 😊, and at 3pm we would leave again until 8pm. Two volunteers would stay home, either morning or afternoon, to prepare lunch/dinner and help out with whatever was needed. 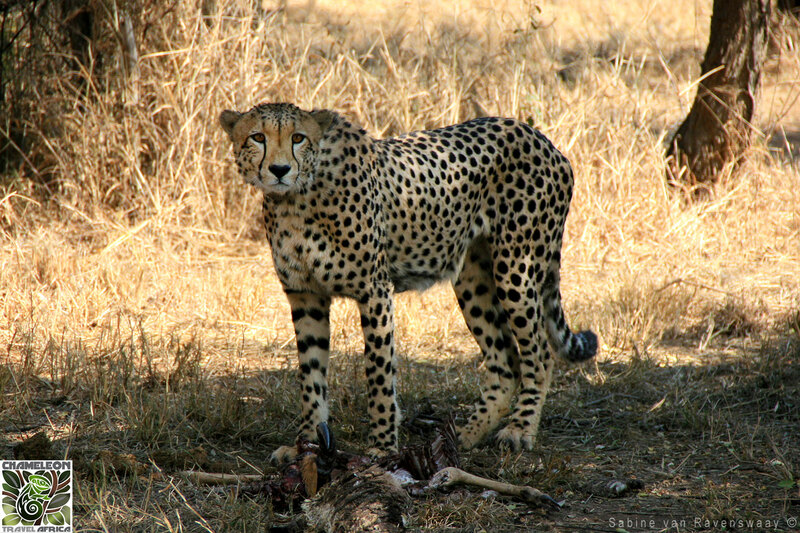 Sometimes we would just drive and see what we would find, sometimes we heard the evening before that certain animals had been seen in an area, and would look for them, sometimes we would have a specific task, like look for a female cheetah. We took lots of pictures of all the animals we saw and collected data (which animal, gps, which road etc). Every day we would also do conservation work, like wrap a tree with chicken wire to project it against elephants. Elephants scrape of the bark of a tree to get to the nutrients behind the bark, but that kills the trees. We also did a sleep out in the bush, and bush walks. 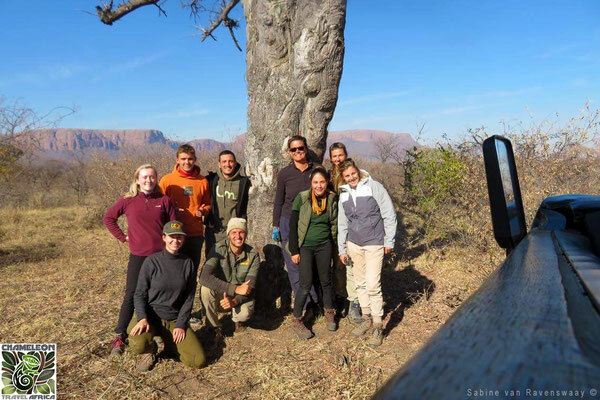 The project has many camera’s in the park, also to collect data of the animals, and sometimes the camera’s needed to be replaced or batteries needed to be changed, and therefore we would need to walk through the bush, was very exciting. 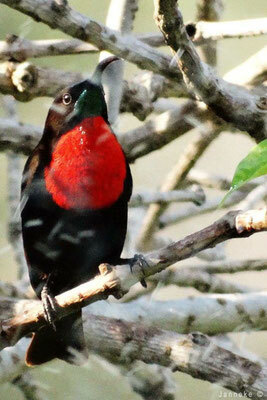 I have been amazed by the amount of animals I have seen, and often so close by, and also by the knowledge of the guides. They would always tell us so much about the behaviour, and I thought it was very interesting to see how they know certain animals are around, sometimes by a specific sound of a bird, they could tell if a rhino was present. I met great people and am still in touch with some of them. I would really recommend this project if you are interested in wildlife and conservation. "Thank you for all your help. You were amazing, answering all my questions and giving me all the information I needed for my trip. I really appreciate your personal support; I don't think many companies would offer the same level of assistance. So thank you again, very much!!" I learned so much about animals and conservation and I am so happy that I have been able to contribute to this project. The balance between work and relaxing was really great. Even though I am not that sporty, I enjoyed the volleyball! I also loved the sleep out, the games we did together and the space we gave each other to do our own things. I never saw the animals so up close and in such a relaxed way: Amazing! I learned a lot of new birds and bird calls! Loved it! This was an adventure, an experience I will never ever forget. I loved being here! Many thanks for taking care of everything! Wow! What an experience. The program at the Reptile Centre is absolutely spectacular. When they say you will get hands on experience they truly mean it. 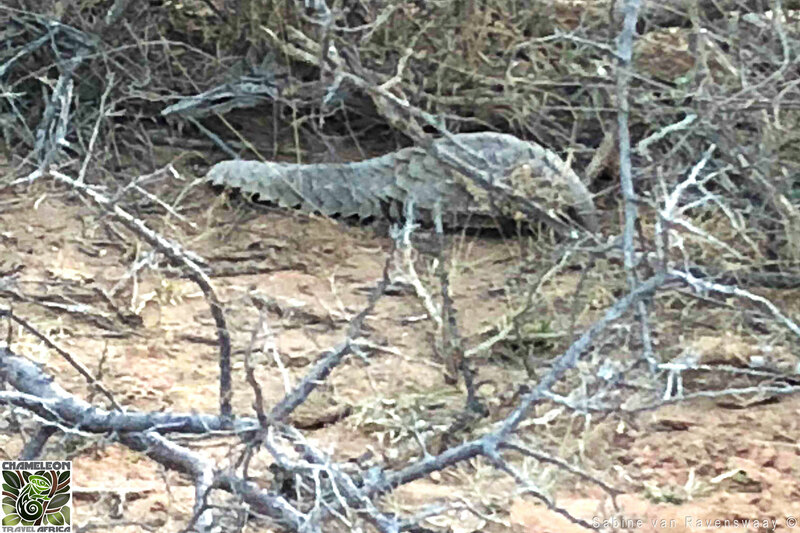 Within my first week I was working with Puff adders, Snouted cobras, and Nile crocodiles. I really wanted to learn to work with venomous snakes, not simply watch someone work with one as I took notes. The Reptile Centre allows volunteers/interns the opportunity not only to learn how to properly handle and care for venomous snakes but scorpions and spiders as well. Whether I am conducting a demonstration on venomous snakes of South Africa, cleaning the enclosure of a Cape cobra, or feeding a large Rock python, I am constantly learning and gaining valuable experience. Perhaps my favorite aspect of working at the centre is the callouts. Within my first week I had gone on five snake callouts. 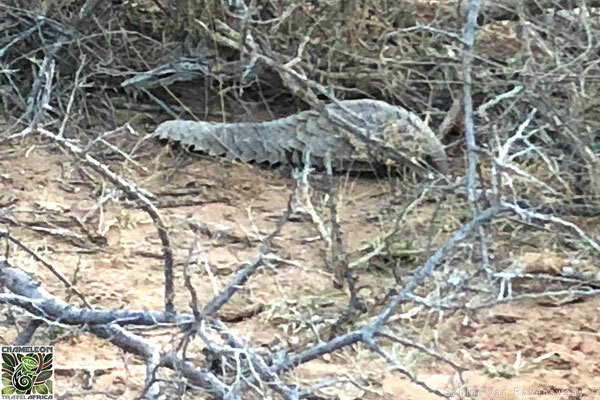 You may be in the middle of medicating a Gaboon adder when all of the sudden you need to drive to a game farm to remove a Black mamba from a lodge, or a Snouted cobra from someone's shower. Once the call comes in we must carefully stop what we are doing and get to the snake as fast as possible. These callouts not only save the snake and people from potential harm, but also provide the opportunity to educate the community about snakes. 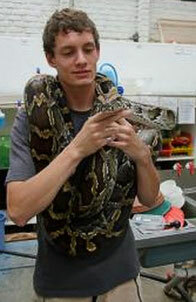 Working at the Reptile Centre is not the only fun thing to do as a volunteer/intern. In my off time I have been swimming in the Blyde river, hiking along the Olifants river, and going on spontaneous night drives in search of wildlife. You do not have to leave the volunteer house to see interesting animals. I have seen several snakes right outside the house, including a beautiful rock python. I have had the opportunity to meet and work with some of the most respected herpetologist in South Africa. I had the opportunity to search for skinks and spitting cobras with one of the most respected reptile authors in Africa, as well as assist him with a photo shoot for a new book. The team at the Reptile Centre are extremely passionate about their work and are more than willing to share their knowledge and experience. Oshea, Jeff Corwin, David Attenborough, and Austin Stevens have all utilized this centre as a resource for documentaries. I absolutely love it here, so much so that I may extend my stay a bit longer! I would urge anyone interested in reptiles and/or reptile conservation to get here as soon as possible. I can assure you that you will not regret it. In fact, you may never leave at all. Via CTA we found out about the Wilderness Conservation Programme. To start of with, the preparation and information we received from Linda (CTA) was outstanding. It is great to have someone assist you with everything, from answering the first question to help with the booking and travel arrangements. It was also nice to have a Dutch speaking contact person who is available to offer assistance if needed. 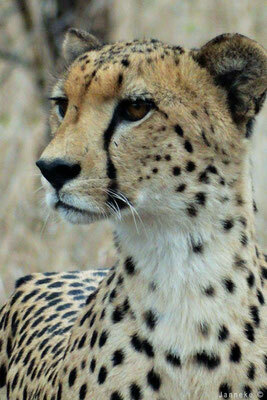 Working at the Wilderness Conservation Programme was truely awesome. There is so much to see, experience, learn and enjoy, each day was filled to the max! The balance between work / observation-research / relaxation is great. Life in the bush! By working at this project, you really contribute to bringing the reserve back to its original state, as it was before modern civilization. 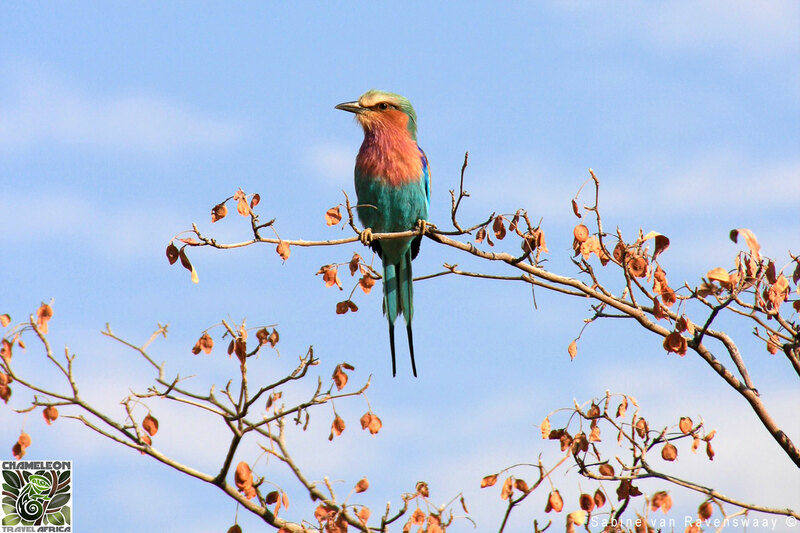 By spending a vast amount of time in the bush, whether it be working or observing wildlife you greatly contribute towards nature conservation. The accommodation is very nice and comfortable and the project leaders are very knowledgeable and professional. We had a fantastic time out there in the bush with their guidance. I'm having an awesome time here at the project. It's a totally different world out here. After a long trip, I was met at an airport situated in the bush. I ended up sitting in the back of a Jeep and straight away noticed I was indeed in the middle of nowhere. 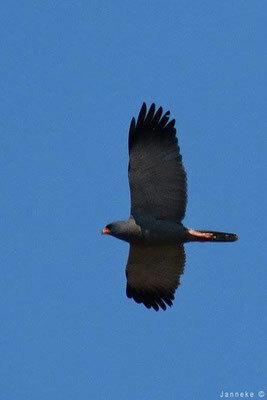 The project is situated between several private nature reserves, where the big 5 roam free. 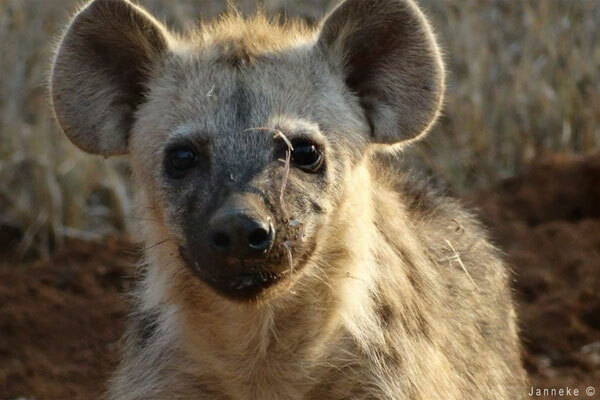 There is a variety of animals at the project and at night porcupines and honey badgers come to the camp looking for food. One porcupine is tame and lies in the communal area, preferably under somebody's feet. He will only erect his quills when feeling threatened. There are also various duikers and other small antelope species walking around. 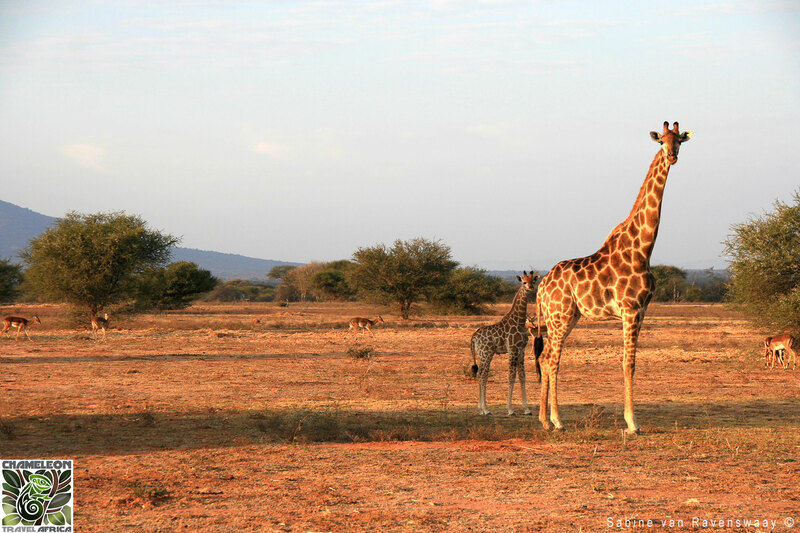 As soon as we are in the reserve we often encounter giraffe (with babies), impala, kudu, etc. We truly are in the bush and I can hardly explain what it is like. During the week there is a strict programme. On Monday we go to a nearby township to fetch the children. The children are so quiet and shy when they arrive at the project. We have breakfast and then the lessons start. We teach them English and Maths, we teach them about politeness and how to make South Africa a better place. You can't compare the level of knowledge these children have to our Western/European standards, so we teach them basic Maths and basic English, like the verbs 'to be' and 'to have'. The classroom is outside of course. At night we usually play games such as bingo, trivial pursuit and pictionary, based on the project and nature. 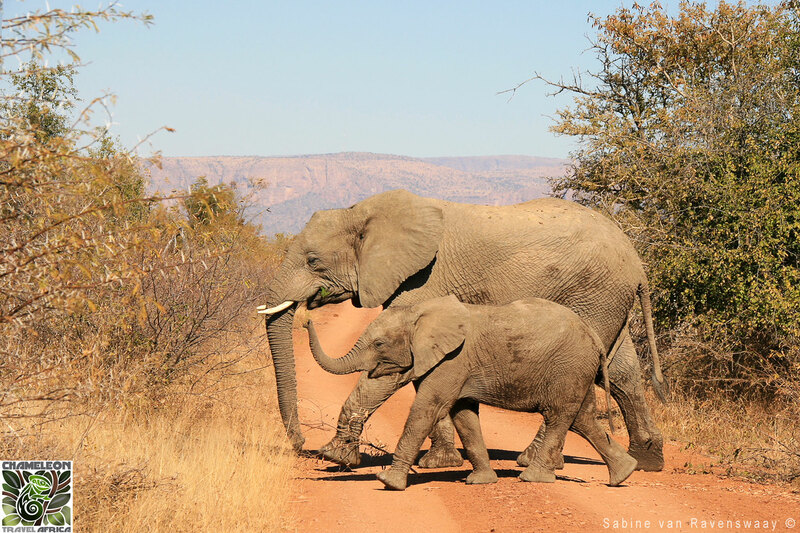 On Wednesday the children go to a game lodge in the area. They do a game drive and besides learning about the bush and looking at the animals, they learn about future job opportunities in the tourism industry. Awesome! As we were driving, I saw this black spot far away in the bush and said 'STOP'! As we approached it turned out to be an elephant behind some bushes. After checking us out, he offered us a better view of himself. We also saw many giraffe, impala and zebra. It's weekend now. The children left on Friday. They were not the same children as when they arrived on Monday. They were singing and clapping their hands. Fantastic! They know so many wonderful African songs and seem to have a natural talent for rhythm, dance and music. Amazing! They proved this on Thursday night, when we were all sitting around the fire. The children sang and danced and just had a great time. I wish us Europeans were more like that. I was truly amazed! By the way, the food is delicious. Every day we are getting a different lunch and supper. They sure know how to cook! During the weekend, when there are no children at the project, us volunteers get to have some more leisure time. On Friday we went to Leopard Rock for sundowners. This is a huge boulder overlooking the bush and the Drakensberg mountain range in the distance. On Saturday we went to Hoedspruit at 8am, to do some shopping for ourselves for the rest of the week. Usually this consists of some beers and a packet of crisps. After lunch in Hoedspruit we went to a restaurant/pub called 'Three Bridges'. There's a beautiful view of the Olifantsriver (Elephants river), and at sunset the hippo's come out of the water to graze the river banks. The first lessons I taught independently were Maths and Politeness! I really enjoyed teaching. The lessons are prepared and developed by the project, so you don't have to invent something yourself. The morals and values that we have, and that they have differ quite a bit. On Friday news reached us that someone tried to sell a pangolin (ant eater), and got arrested because of it. The pangolin was brought to us for release in the bush. What an amazing creature, it is really special to see one. The pangolin received 2 injections and was kept for a little while to monitor it. On Sunday we let him go in the bush. 25 people (family and friends) pitched up to witness this special occasion. The pangolin is a fascinating creature, it can walk on its hind legs and curl itself up into a ball as to protect itself. The project leader organized for us to come with and fetch the leopard on Saturday. After the vet had darted the leopard, we all went into its enclosure to watch. The vet microchipped the leopard. I had a chance to touch him for a bit. The fur is so soft and beautiful. What a spectacular animal! By the way, the leopard was brought to the project, because he lost his canines. He would not survive in the wild. It was quite an amazing experience! Stepping off the plane onto African soil after what seemed like endless airports and aeroplanes is one of the most memorable moments of my life. Like many people, I always wondered what Africa was really like, compared to the TV screen version. It certainly does not disappoint. My African adventure consisted of one month at a world renowned Reptile Centre and then another with the Wildlife Experience Project. I'm not sure how I managed to stuff so many amazing memories into two months! 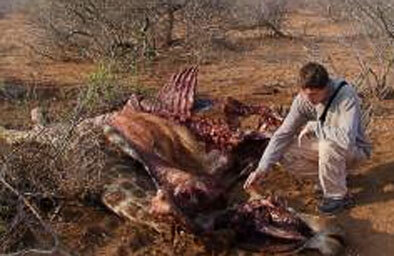 South Africa is one of the best places in the world to work with and learn about reptiles. The Reptile Centre is a must for anyone passionate about reptiles and creepy crawlies or simply interested in learning more about them. The team at the centre really knows their stuff, so even if you're not too hot on reptile knowledge, you soon will be. The centre plays a very important role in reptile conservation and education, both locally and on a much larger 'scale' (no pun intended). Volunteering is an amazing opportunity to get involved. I loved being part of the team at the Reptile Centre and volunteers get stuck in with all aspects of the parks work. I particularly enjoyed responding to the 'call-outs' and piling into the pick-up with the other volunteers on rescue missions. I think that one of the most thrilling aspects of work at the park is its unpredictability. On some days we were responding to maybe three or four call outs, and volunteers take it in turns to make the captures. It's a real buzz! 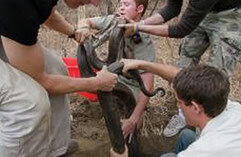 Two rescues which I was involved with resulted in saving the lives of two 4m rock pythons and up to a hundred eggs. Encounters with such impressive wild animals really stick in your mind! Of course, a good camera is a must-have item and I soon learned to always have it to hand. There is always work to be getting on with at the centre. The day usually starts with a check of all enclosures. The animals need to be removed from their enclosures so that they can be cleaned. This means volunteers are constantly practicing their handling techniques. When you feel confident enough and the curators are happy with your handling, volunteers have the opportunity to perform snake demonstrations and spider/scorpion handling sessions with the public, including school groups. The first couple of times, it is really nerve-racking, but an amazing experience when you have done it. It is nice to think that most of the people you talk to have probably never been so close to these animals. Unfortunately, reptiles are persecuted all over the world and are often very misunderstood. It's a brilliant feeling to have influenced people's perceptions of these animals and to have helped with their on-going conservation. Volunteers quickly become very good friends with each other and the centre's staff. I was sad to leave as I had such an amazing experience, met some wonderful people (who I am still in contact with now) and learnt so much. But I was also looking forward to my next month with the Wildlife Experience Project. 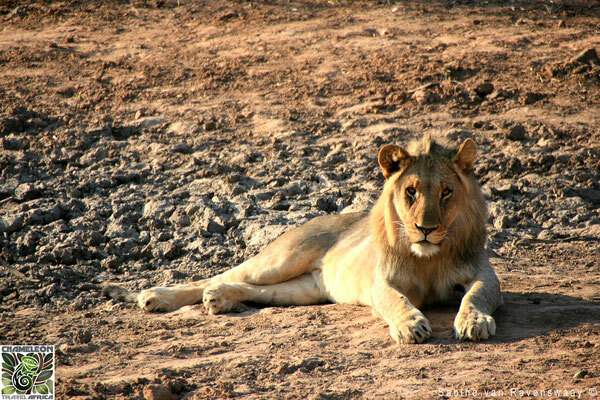 The bellowing lions succeeded in making my first night at the Wildlife Experience Project a rather sleepless one. What an introduction to life in the bush! The daily morning bushwalks were a real highlight of my time here. Exploring the reserve with the project leaders and learning to identify the millions of different plants and animal species was the perfect way to start the day. Followed by lectures and practical reserve management, this was a brilliant introduction to Africa and the work of reserves. Living in the bush was an amazing and often surreal experience. I was lucky enough to witness the transformation after the rains. Suddenly the arid landscape burst into a magnificent, lush green Africa; and with rain came the wildlife. We were often visited by wandering bull elephants just metres from the camp fence and could spend hours on the watch tower spying on the zebra, giraffe, wildebeest, buffalo, warthog and many more visitors to the water holes. Nothing compares to seeing these magnificent animals in their natural environment. The project provided an ideal base to explore the surrounding area and go on the various excursions, or to escape the mid-day heat in the swimming pool. 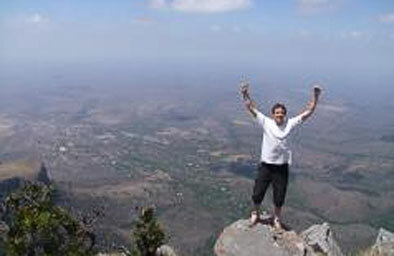 A few of the other volunteers and I often rented a car from Hoedspruit and went exploring. Most weekends we were off to Kruger National Park, a breath-taking reserve definitely worth a few visits. Driving back in the evening on one occasion, we saw 18 snakes on the road, an indication of how much wildlife there is in this area! Volunteers are regarded as members of the family and it is an amazing, homely atmosphere on this project. For me, this was a life-changing and inspiring experience. For anyone thinking about exploring Africa, my advice would be to get out there and have the time of your life. 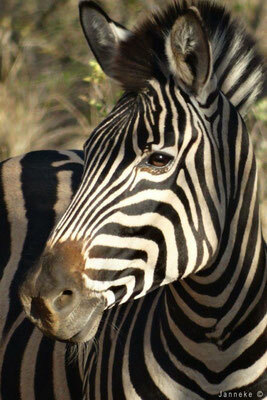 Africa is a simply mind-blowing place and unforgettable experiences are guaranteed!